A group of scientists who visit a space station are hit by a mysterious radioactive wave and develop powers, and then have to deal with the consequences. It’s the origin story of the comic strip Fantastic Four and I thought it was pretty ace. I especially like that, before they really get a chance to figure out what kind of ‘powers’ they have, they end up in a situation in a very public place, and have the eyes of the world on them. What was most poorly presented (and this may well be a reflection of that in the comic book) was the reaction of Ben Grimm’s fiance after he becomes The Thing. He is a giant made out of rock, but is still himself personality wise. She just runs, screaming, from him, and is portrayed as the bad guy. I think that that reaction in the face of such a strange transformation is pretty reasonable, and that it could have been explored in further detail. But, it is a comic book film, after all; perhaps character depth is asking too much? I found it really odd seeing Chris Evans as the arrogant idiot Johnny Storm after being the troubled, quiet Captain America in other Marvel films. I thought this would rule out the Fantastic Four hooking up with the Avengers at some point, but it looks like there is a new Fantastic Four film coming out next year, so I guess we’ll see. 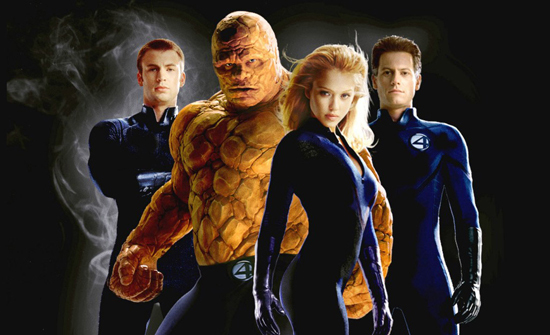 A little bit of research shows that the 2007 film, Fantastic 4: Rise of the Silver Surfer has the same cast as this film, but the 2015 film is a new cast, and there is already a second Fantastic Four film scheduled for 2017. Looks like the Fantastic Four are being reinvented much as the Incredible Hulk was.